On Monday I laid the first lengths of rail down on the Central Valley tie bases. The first job was to install a short section of transition track between the PECO track and the CV track. This is located about where the train will enter the Temple Court scenicked section from the helix. The transition piece was required due to the different overall track heights between the PECO and the CV track, which was around one millimetre, with the CV track being less. I managed to find a short length of Micro Engineering code 70 track and this was duly made to fit and feeder wires soldered in place. In the second picture you will notice quite a bit of adhesive. 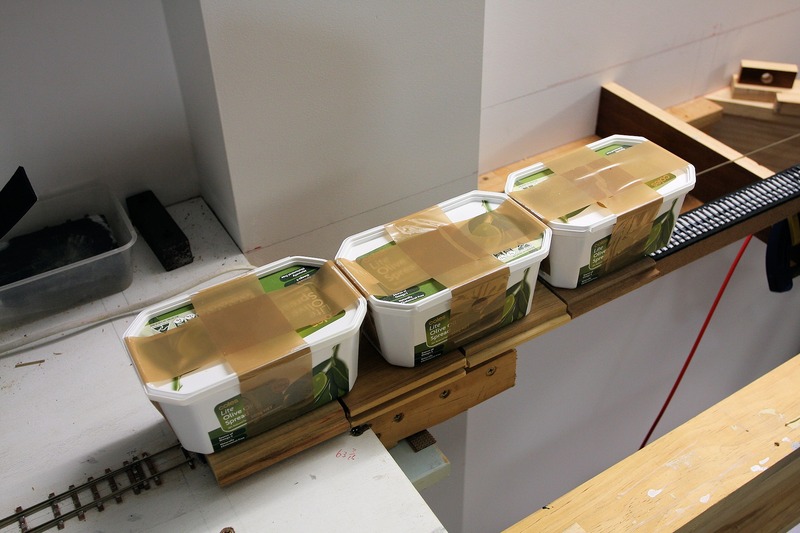 As the transition section could not sit flat on the foam due to the track height difference, the plan was to have it sit ‘suspended’ in the bed of glue. Liquid Nails was used, but once I had the track in position, I realised I had applied a tad too much glue! The excess glue will be removed with a Dremel ‘burr’ tool once set. In the image below, I have pointed out that the rail joins are offset. 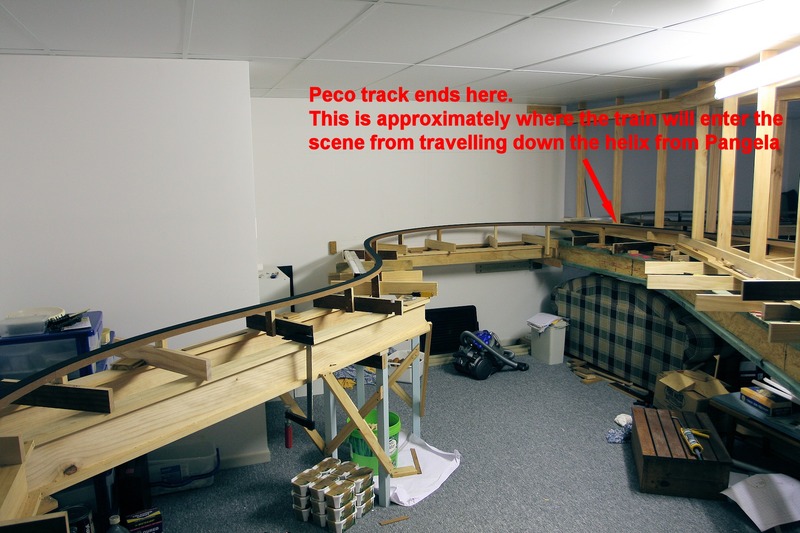 This is similar to what I did when laying the PECO track in the helix. It’s always better to have rail joins staggered, as this helps with the flow of the track and the possibility of a kink is avoided. I must now mention that the longer bit of rail at the top in the above image was pre-coated with the contact adhesive as well as the few CV ties that it would be glued to. 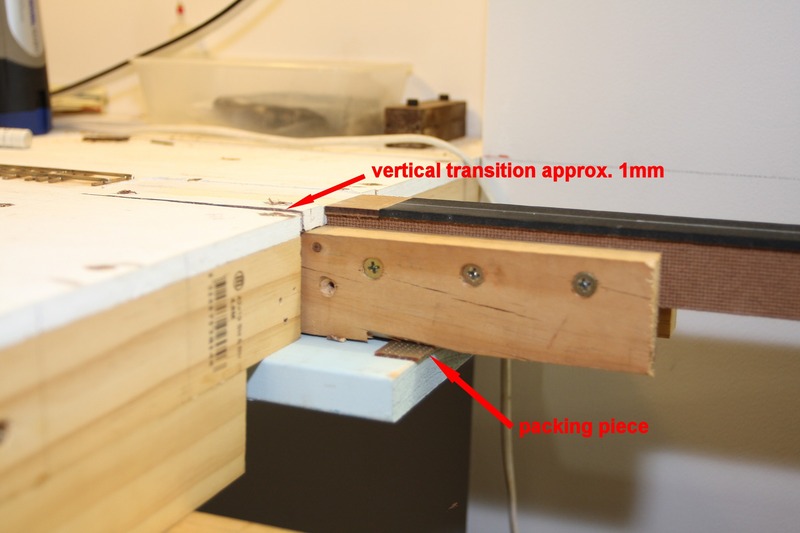 Once it was in position, the rail was held down, located in the moulded tieplates, and MEK applied with a brush to the tieplates to activate the adhesive and make the bond. This will be explained further on. 1. 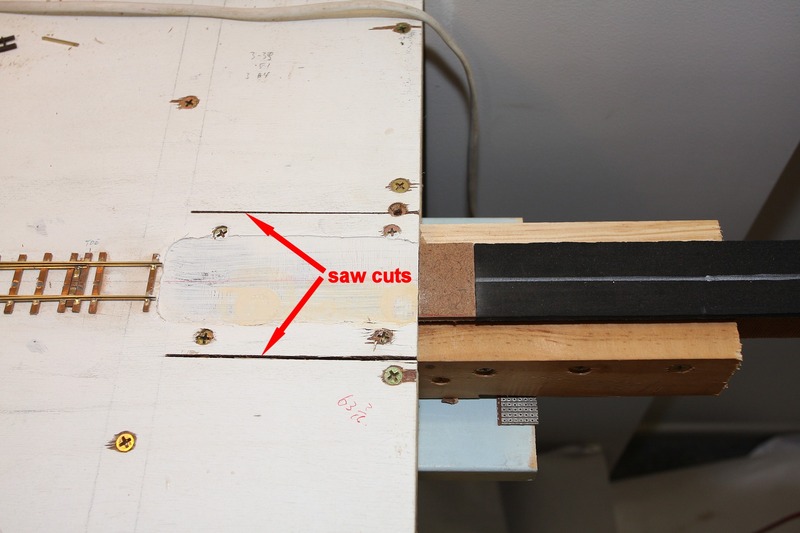 Depending on the location, the rail needs to be pre-curved. 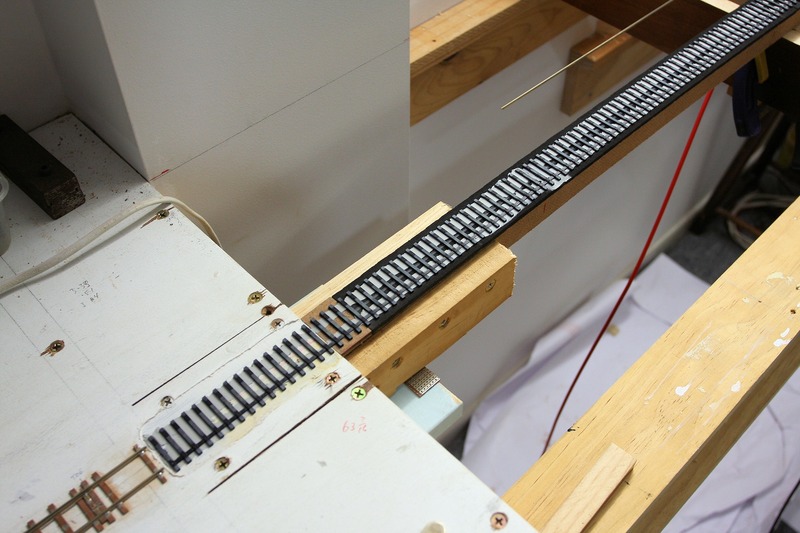 The main reason for doing this is to alleviate the stresses on rail joins where the rail would be under tension and have a tendency to want to ‘spring’ out. 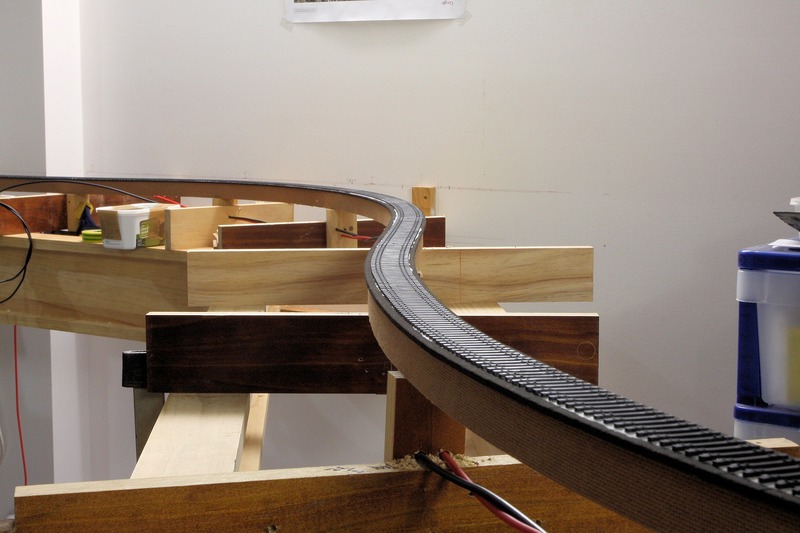 The rail is curved using a Rail Roller from Fast Tracks. The bend can be adjusted to suit whatever radius you have. I found that after a few passes through the tool, I achieved just the right amount for the rail to virtually sit in place on its own. 2. 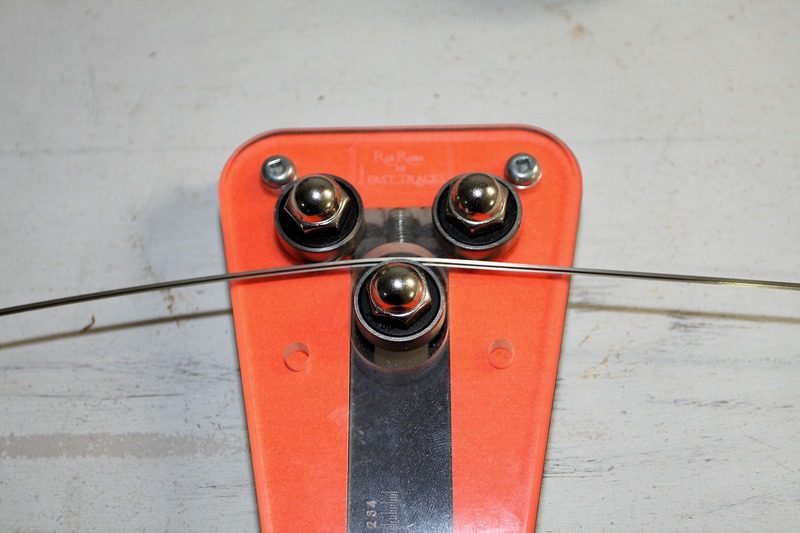 Once the rail has been curved, it is placed in position and a mark made at a suitable location for the feeder wire to be attached. With the semi-hollow nature of the spline roadbed, it allows the feeder wires to be pulled through the foam and spline. These will be hidden by the ballast later on. 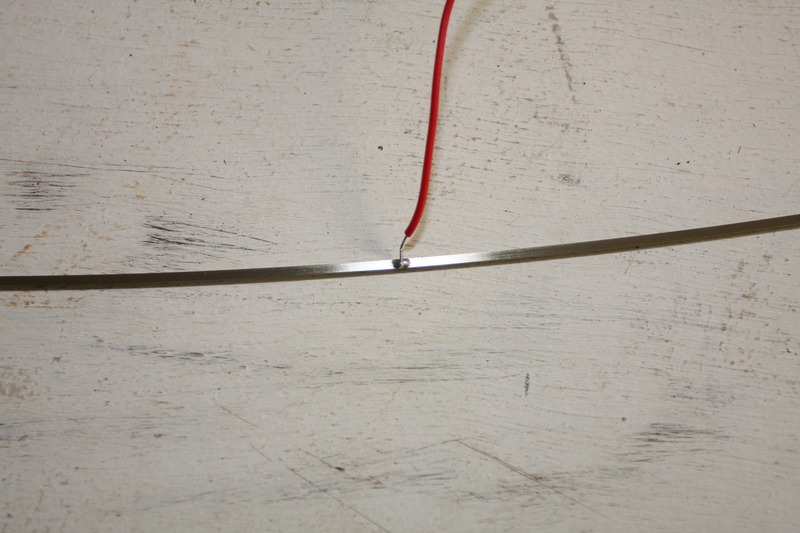 So, a short piece of hook-up wire is soldered in place on the underside of the rail. 3. The underside of the rail is now cleaned with Methylated Spirits to ensure a good bond with the contact adhesive. 4. 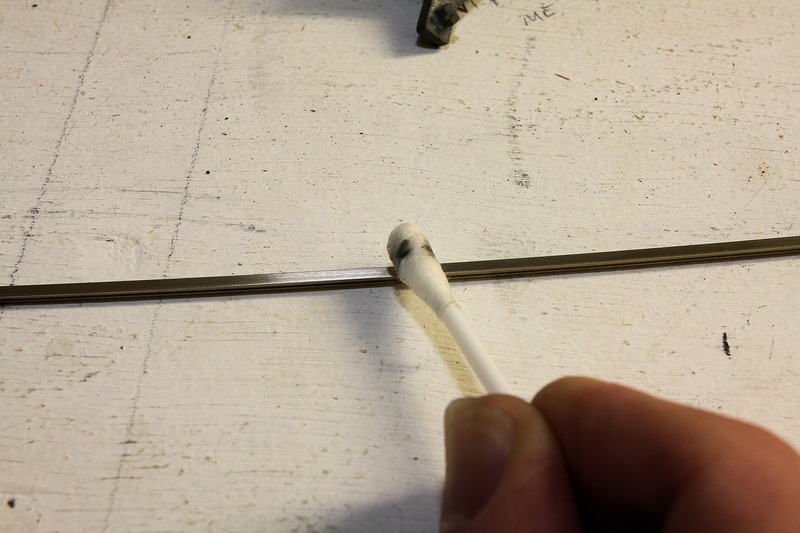 Once the rail is clean, the contact adhesive & MEK mixture is applied as a thin coating using a cotton bud. 5. The same adhesive is also applied to the tieplates on the CV track. Again a thin coating is all that is required and is applied by brush. Both the rail and tieplates are left to dry for at least an hour. 6. 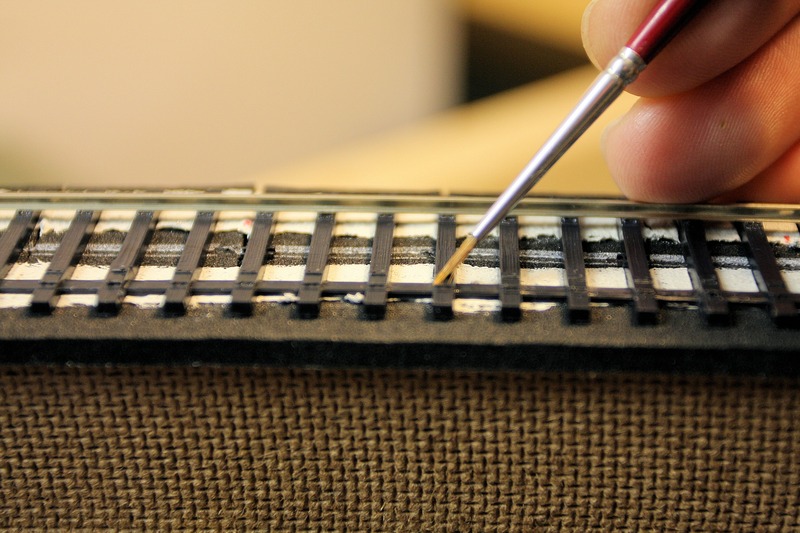 Once the adhesive is dry, the rail is placed in position on the moulded tieplates, held down with light pressure with a small block of wood, and MEK is then applied to the rail/tieplate join with a brush. Keep pressure applied for about thirty seconds then move on. I only do about ten sleepers at a time. At this point, I am only laying one rail. I’ll probably continue with one rail all the way to the staging yards, then come back and fix the second rail in place. I’m hoping I won’t need to use any gauges as the moulded tieplates form the ‘gauging’. Overall I am very pleased with how it’s all going. A lot better and easier than I had imagined. Well, after a lot of procrastinating over the last few months, I have finally started laying down the first sections of Central Valley Model Works (CVMW) tie (sleeper) bases in the Temple Court section. First, a bit of background as to why I chose the CV tie strips over traditional flex track. After I had finalised the track plan way back in 2009/10, I pretty much knew how much track I would need for the scenicked sections. There is a total mainline length of 458 feet (139 metres) between staging yard exits, including the helix. The helix and short section from the bottom of the helix to the start of the Temple Court scene is 109ft (33m). This leaves 349ft (106m) of scenicked run. Add to this the trackage in the loops at Kankool, Ardglen and Pangela of 51ft (15m), this takes the total scenicked trackage to 400ft (122m). Traditional flex track is easy to install but is expensive. 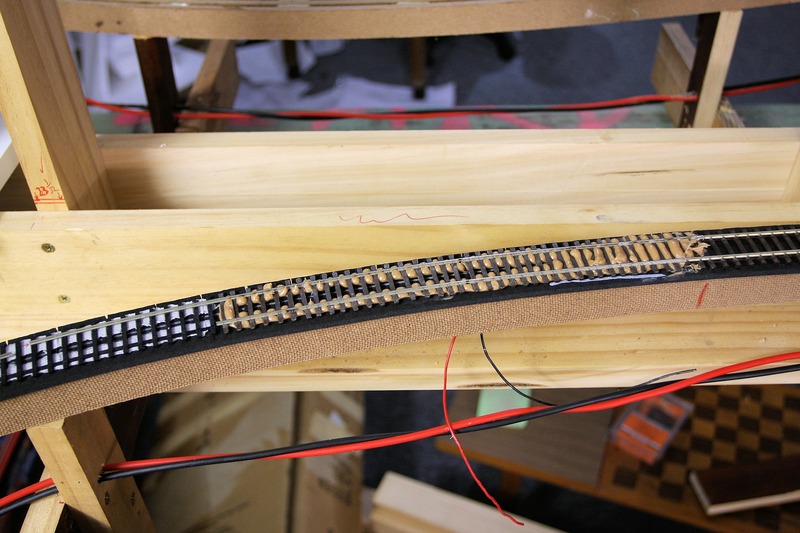 For example, if I were to use Micro Engineering Code 70 flex track, I would need around 130 lengths (3ft), which at $7.25 (from The Railcar) would cost me $942. For the equivalent three foot length of Central Valley ties plus code 70 rail, at the time (2010), cost me around $3.00. The CV ties came in a bulk pack of 50ft for around $45 and code 70 rail was around $40 for 33 lengths (3ft lengths). So you can see the savings I’ve made. The CV ties and rail were purchased from Proto87 Stores. The other downside of flex track I have found, especially Micro Engineering, is it is very hard to lay out in curves, as the rail is quite tight in the moulded ‘spikes’. The sleepers also are a bit on the thin side. So, the CV track I eventually went with was their #2002 ‘Branchline’ type. These had 8 foot long sleepers, which according to the Trackwork Manual from Greg Edwards, is what NSWR plain track was laid on. The sleepers also came out very close to correct width (9”) and height (4.5”). Even though CV label this track as ‘Branchline’, the sleeper spacing came out closer than their ‘mainline’ track, which looked a little too close for me. Anyway, I decided to give the stuff a go. 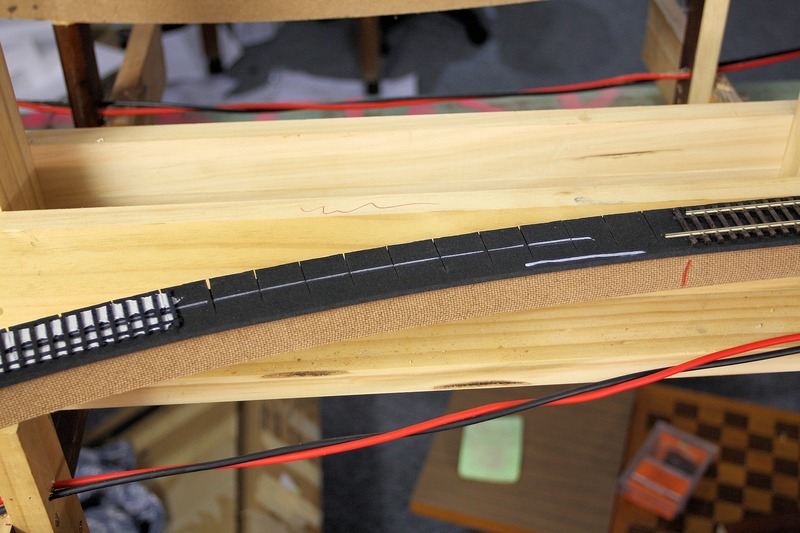 So, the idea of the CV ties is that they are glued down to the roadbed and the rail is then glued to the ties. The CV team have always recommended a product called Barge Cement, which is essentially a flexible contact cement. Over about the last 12 months or so, I have been trying to source this Barge Cement here in Australia but to no avail. It is available overseas, but I was always wary about getting it shipped here as it is a flammable product. I eventually came across an equivalent product called Bostik Contact Bond. This also proved difficult to obtain, in Port Macquarie at least, but I eventually found some at the local Officeworks store. 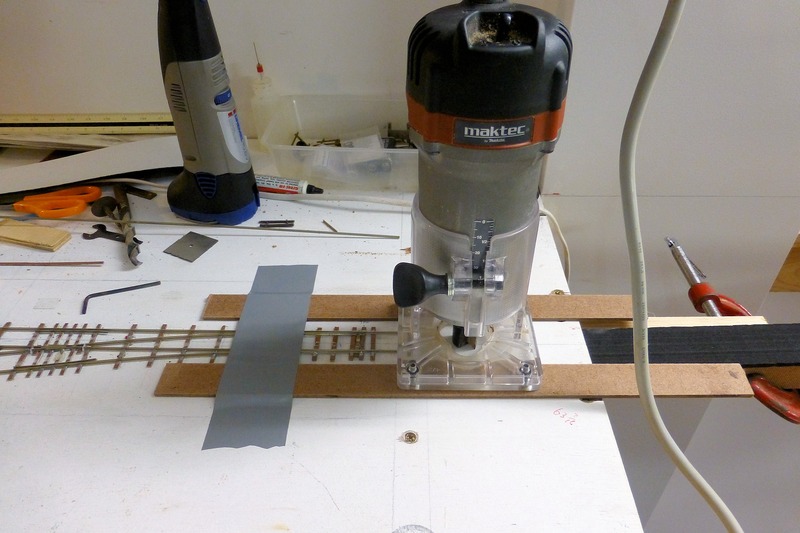 Now, I have done a lot of research on this gluing of rail to plastic, and there seems to be division among modellers. 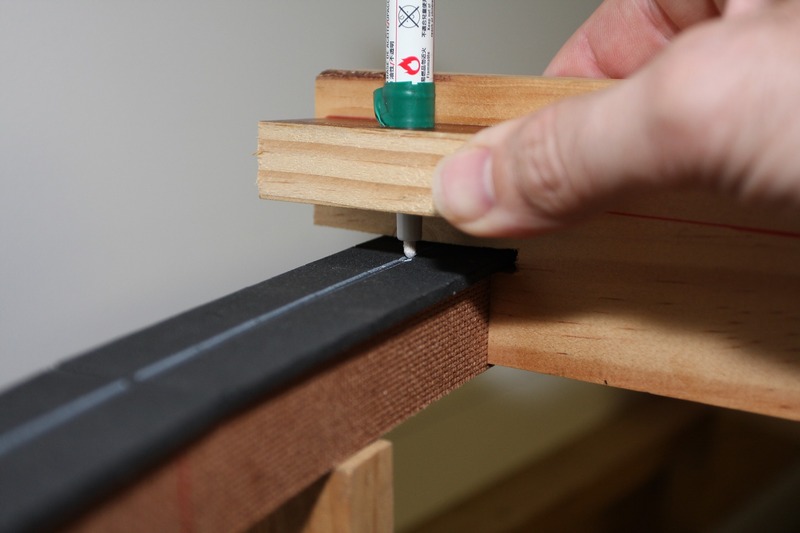 Some users swear by it, others not so much Some say that both the base of the rail and the ties must be coated in the glue, others say only the base of the rail is required to be coated. The idea behind the gluing method with the Barge Cement, is that it can be activated/reactivated with MEK. 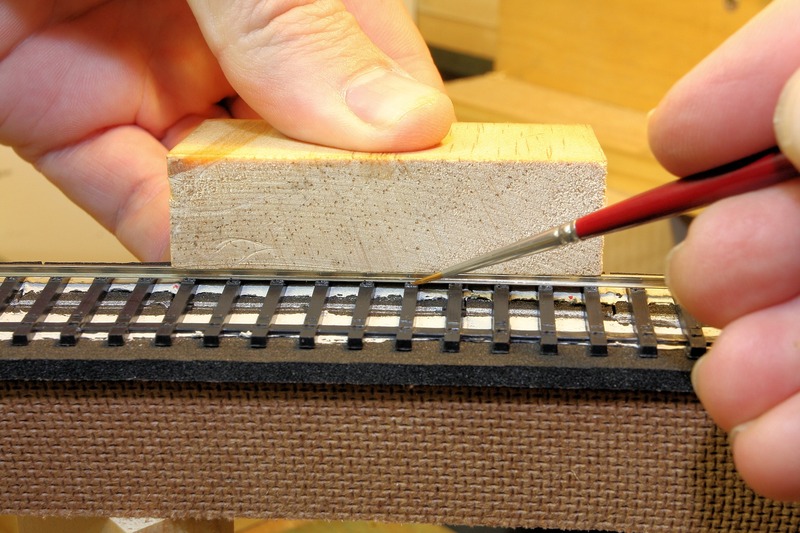 This means that once the rail is in position on the sleepers, a small amount of MEK is applied with a brush which reactivates the glue and makes the bond. 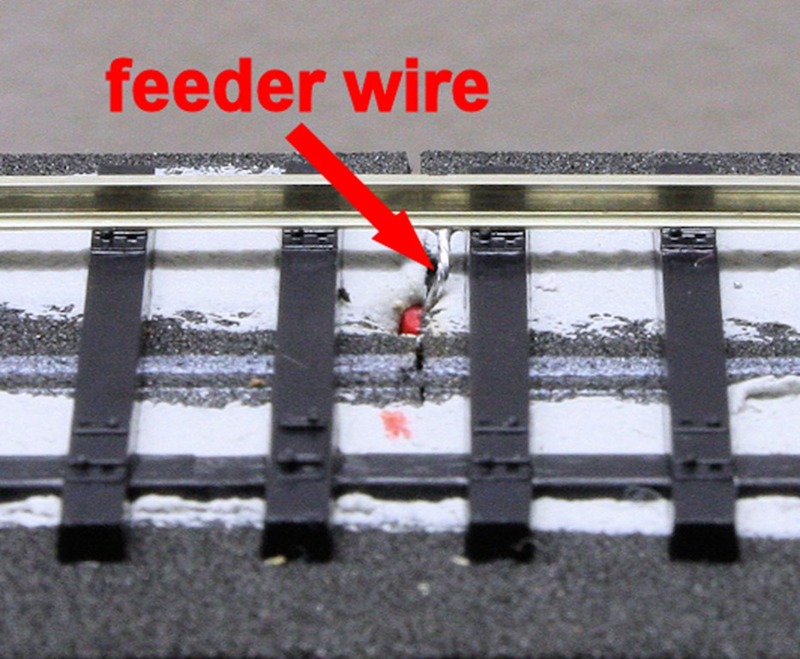 This essentially bonds the glue on the rail with the plastic sleepers. A thinned down mixture of the glue and MEK has to be made. I followed an article I found on Model Railroad Hobbyist. The Bostik product remains mixed over time and does not separate from the MEK. 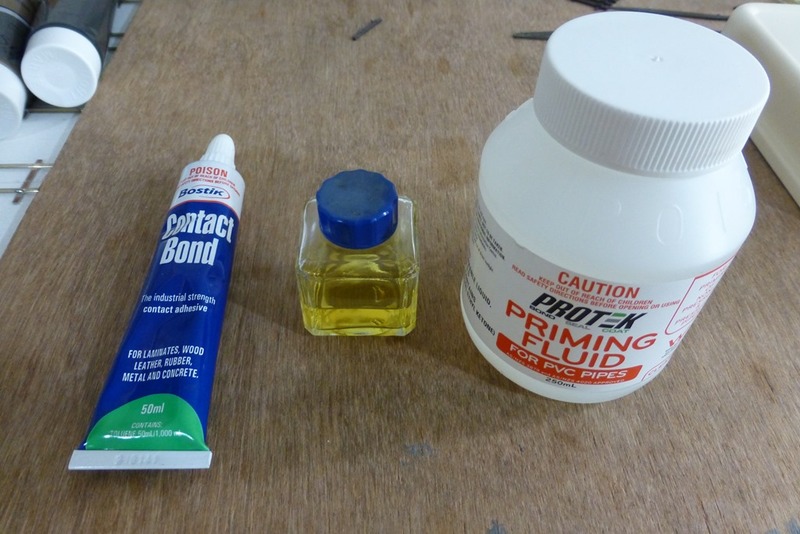 The photo above shows (L to R) the Bostik glue, the glue/MEK mixture and the MEK. The MEK is Plumbers Priming Fluid which can be obtained from hardware stores or plumbing supplies. I made a 2 to 1 mixture (MEK to glue) as a test first, and tried it on a short section of the CV track. The thinned down mixture is applied using a cotton bud. A good, thin and even coating is applied to the underside of the rail, then the same done on the tieplates on the sleepers. Initially I only coated the base of the rail, but this did not produce a strong bond. 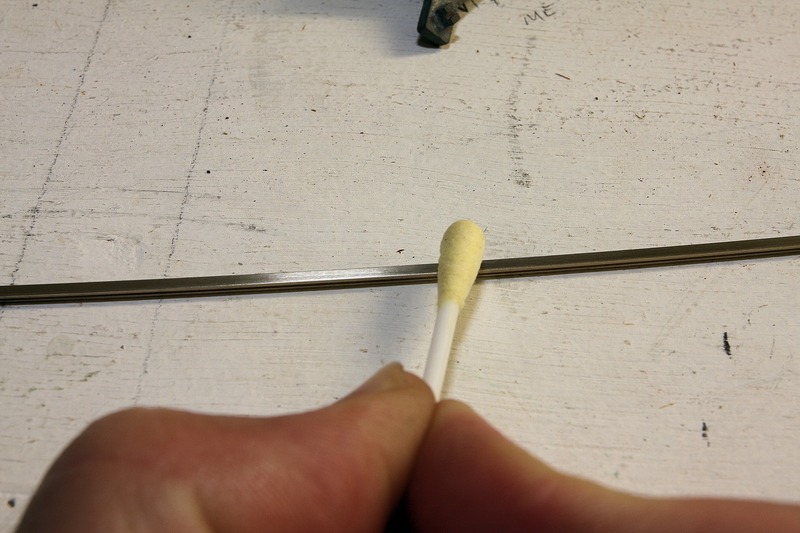 The rail is then held in place and a small amount of MEK is applied to the joint. Slight pressure is required for a few seconds to make sure the bond has occurred. This first test seemed to go OK, but was a bit hard to judge how it would go with long lengths of rail. I may end up using some Proto87 Stores scale spikes in strategic places just to be safe. 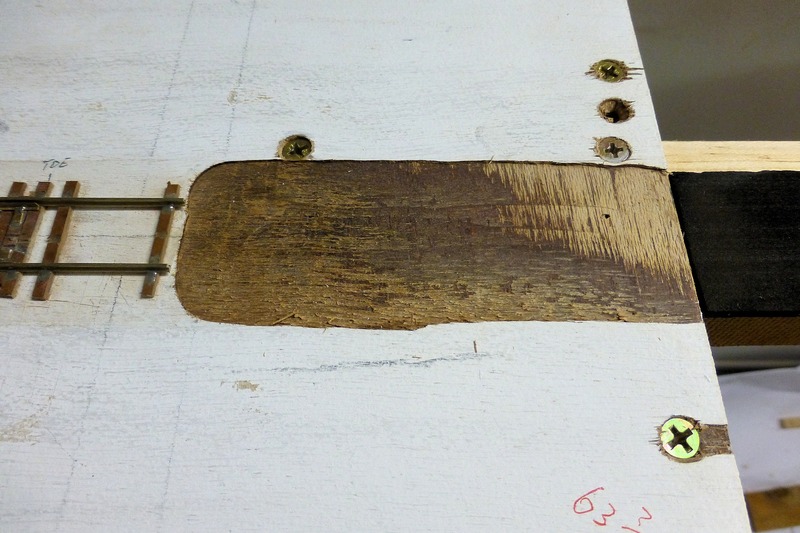 Oh, the rail must first be cleaned with methylated spirits prior to applying the glue. Before laying of the CV track could start, some preparation work had to be done at the exit of the staging yards. The thickness of the CV ties are slightly thicker than the PCB strips I used for the storage yard track, so this necessitated a slight recess to be routed out at the transition point. I simple jig was setup up for the router and about 0.7mm was removed from the top. Next job was to mark a centreline on the foam so I had a guide where to lay the track. As the foam is black, I needed something that would leave a line that was visible. 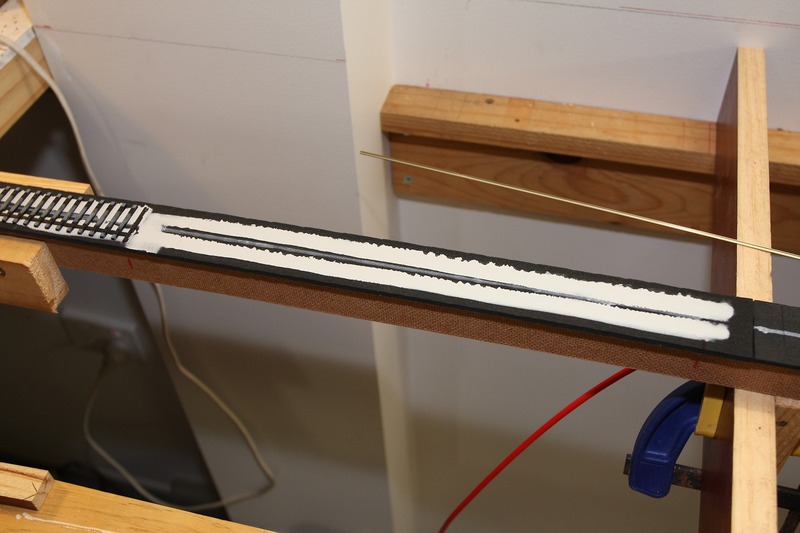 I bought a white paint marker pen from a local art supplies shop and fashioned a timber jig to hold it vertically and whilst held against the spline, I could move it along and leave a line. The grade from the Down staging yard through Temple Court and to the helix is steeper at 1.8% (1 in 55) than the rest of the layout at 1.19% (1 in 84). This meant I had to try and ease the transition from flat to grade at the exit from the staging as smooth as possible. I carried out some work at the location to allow for a vertical easement. See the pictures below. I hope they are self explanatory as it’s difficult to put into words what I have done. Once this was completed, the spline was fixed to the staging yard benchwork. As the CV track sections are approximately one foot long, I decided to glue three sections together into three foot lengths to make laying a bit easier. At each end of the track sections, there is a half sleeper that when glued together at opposing ends of the track sections, a full sleeper is made thus making long smooth runs of track base. Have another read here for a full explanation. 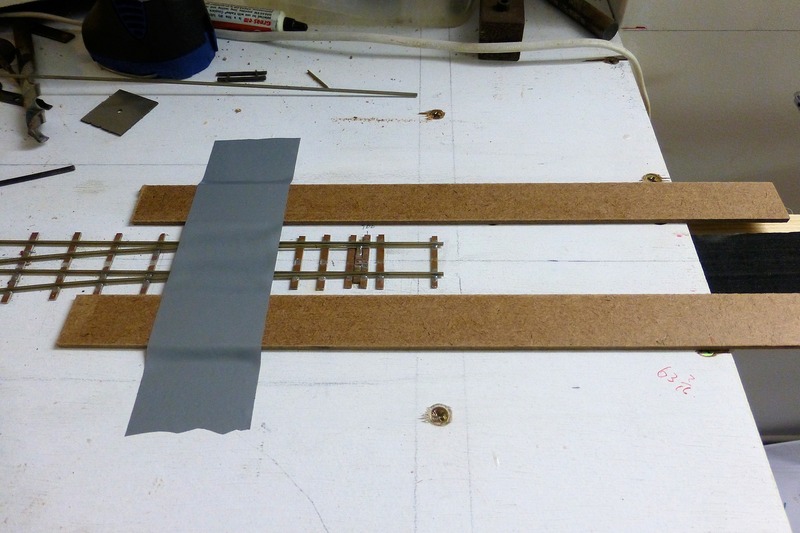 Through most of the research I have done on the use of CV track, many users recommend gluing the ties to the roadbed using a flexible sealant eg. caulk or No More Gaps. This allows for some working time after laying the track in place. I chose to use a coloured acrylic caulk as I wanted to be able to see it when I applied it to the black foam roadbed. I applied a thin bead of caulk either side of the track centreline which was then smoothed out to a thin, even layer using a metal spatula. The track sections were then placed in position on the centreline and checked for alignment. This was easily done by getting down low to the track and looking along it, using the raised tieplates as a guide, which were quite visible in checking for rail alignment. When I was satisfied everything was OK, some weights were placed on top until the caulk cured sufficiently, which was generally a minimum of 12 hours. There is sand in the containers. I did experiment with hand painting the track with water based paints prior to laying, but this proved time consuming, so the plan is once the track is down, to use the airbrush to paint the sleepers a base colour, maybe a grey, then mask off the sleepers and spray the tieplates a rust colour, then paint the rail the same colour, then glue the rail in position. Then, prior to ballasting, some extra painting will be done, maybe some thin washes to add some randomness to the sleeper colours. This may all prove a waste of time, as once ballast is applied, it will probably cover the sleepers anyway. Maybe just the base grey colour will suffice. We’ll see how all that goes!! That’s where things are up to at the moment. I have got track sections down to a bit over halfway to where the Peco track currently ends. Once this is all down, then I will start painting.